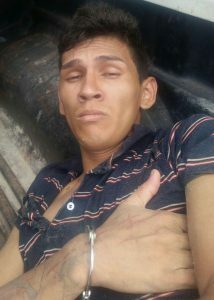 A Brazilian, who was among 100 prisoners who escaped from a jail in his home country, was Wednesday arrested in southern Guyana, Guyanese police said. Police said he has been “positively identified” as Roger Batalha Rodrigues. He has since been handed over to law enforcement officials in Brazil. At the time of his escape Rodrigues, had been serving a sentence for vehicular theft. The Guyana Police Force said since the establishment of the Mounted Branch in Lethem on December 04, 2015 in an effort to combat crime in isolated areas, that section has ensured that its presence is continuously felt. “So far, a number of persons have been arrested, charged and committed to prison for various offences including trafficking and possession of narcotics and possession of ammunition,” police said. Five other Brazilians were nabbed during this week in Brazil as police probed an armed robbery committed on a cellphone and jewellery shop in Lethem. Three men were arrested for that incident. Subsequently, two Brazilian women were among four persons who were arrested at a house in Tabatinga, Lethem. Police said they found a gun and ammunition in the building.